The 5-3 New York Giants are currently in second place in the once-again competitive NFC East behind the 7-1 Dallas Cowboys. Most figure the Cowboys are shoo-ins for the division title, but keep in mind the Giants have already beaten the Cowboys once. If the Giants can get within one game of Dallas, the December 11th game against the Cowboys at MetLife Stadium looms large. First the Giants must defeat the always-schizophrenic Cincinnati Bengals, a 3-4-1 team that at times looks like world beaters and at other times an also-ran. The Bengals run a 4-3 defense that is currently ranked 25th in the NFL (23rd against the run, 21st against the pass). The strength of the defense is the defensive line, led by DT Geno Atkins (3.5 sacks) and LDE Carlos Dunlap (5 sacks). The line may not get a lot of sacks, but they get pressure (hits on the QB) and knock down a lot of passes. The linebacking corps will be missing middle linebacker Rey Maualuga. It is a physical but not overly athletic group. The safeties are big and there is some talent at corner. The Giants are coming off a 28-point “explosion” against the Philadelphia Eagles and are looking to build upon that success. Look for Ben McAdoo to rely more and more on young players like WR Roger Lewis, RB Paul Perkins, and TE Jerell Adams moving forward. Lewis adds more explosiveness to the wide receiver position than Victor Cruz, as does Perkins to the running back spot. The chief challenges are up front. 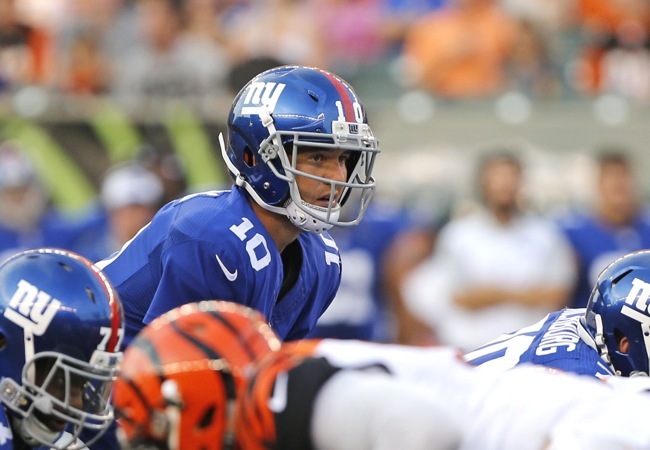 The two weakest links on the Giants offensive line will be facing the Bengals best players. The undersized Brett Jones fills in for the injured Justin Pugh at left guard. His first start will be against Atkins, who is one of the NFL’s best defensive tackles. Right tackle Bobby Hart will have his hands full with Dunlap. That all said, this is an opponent who the Giants can move the ball against. The Giants have done a good job of cutting down their offensive penalties (although there were a few frustrating false starts last week). It’s now time to cut down on the turnovers. Play a clean game. Spread the less athletic Bengals out and get the ball to Odell Beckham, Sterling Shepard, Roger Lewis, and Paul Perkins in the open field. The strength of this current Bengals team is their offense, which is currently ranked 6th in the NFL (7th in rushing, 4th in passing). The Bengals have an experienced offensive line and are loaded at the skill positions. Why the team can be so schizophrenic at times is the play of their quarterback – Andy Dalton. That said, Dalton is completing 67 percent of his passes, has only thrown three interceptions, and fields a 98.0 quarterback rating. The headliners are the passing targets, but the Bengals have a very underrated running game. Running back Jeremy Hill averages 5.0 yards per carry and has scored five touchdowns. Giovani Bernard has chipped in with two more. The Giants defensive must prevent the Bengals from being multi-dimensional on offense and keep the team’s ground game under control. When the Bengals throw the ball, they have two very dangerous targets: All-World wide receiver A.J. Green and tight end Tyler Eifert, who missed a lot of time due to an injury but who is healthy now. Dalton also throws a lot to Giovani Bernard out of the backfield (31 receptions). Ex-Patriots wideout Brandon LaFell (4 touchdowns) has benefited from the attention that Green receives. To date, the Giants two top corners – Janoris Jenkins and Dominique Rodgers-Cromartie – have done a very good job of shutting down their individual opponents on a game-by-game basis. But Dalton won’t be afraid to throw to Green against these two. This is a game where Jenkins and DRC really could impress if they keep Green’s damage to a minimum. What has to worry Steve Spagnuolo however is the 152 yards accrued by Eagles tight ends last week and now having to face Eifert, who is one of the best pass-receiving tight ends in the game. It will be very difficult to double Green and Eifert and stop the running game. This is why the Bengals can be so dangerous. If the Giants play back, the Bengals will run the ball. I hate to say it, but much depends on what version of Dalton shows up on Monday night. The Giants are rapidly turning into a special teams unit that can block field goals and punts. On the other hand, Dwayne Harris really appears to be in a funk. Not only has he yet to break a big one, he is making questionable choices in the return game. We have yet to see Robbie Gould in a pressure-packed FG situation. Brad Wing and the punt coverage team is coming off of a weak game against the Eagles. Don’t let the Bengals losing record fool you. They are a dangerous team with a fine defensive line and a well-rounded and potentially explosive offense. We are about to discover if the Giants are going to be serious contenders for the division title or if they will have to focus on a Wild Card spot.